I made a Haiku Deck to express these thoughts which you can see below. Grab it if you’d like to run/loop a simple presentation about Children’s Book Week 2015 and the importance of reading. It’s also available for download at Slide Share. * Are there opportunities for kids to learn from experts such as authors, publishers, book reviewers and passionate readers? * How will students learn from each other and share their learning? * Are we providing kids with choices? * Are there challenges and opportunities for creativity and innovation? * How will everyone reflect on their learning and the whole Children’s Book Week experience? * Use an introduction like “Shining a light on …” to introduce authors and illustrators to students. Children could work collaboratively to report on a chosen author/illustrator (list of works, quotes, biography etc) and present work digitally or on a display board. * How do books light up our lives? Absence of light equals dark. Has being without books made some periods in history very dark indeed? In many parts of the world, reading books means that people receive an education, and that impacts their lives profoundly. Discuss this with kids and brainstorm some ways we can help. What books have we learnt from? * If you'd like to use the shortlisted books as a focus, visit Mrs Mac's Library for links to author pages, teaching notes and other resources. 1. Popsicle Flashlight and other Instructables projects with light. 2. Investigate painting with light and incorporate your image into a Children’s Book Week poster. Kids could try writing with sparklers in the air at night and have an experienced adult photograph them using a suitable shutter speed. (Grab some photography hints via BeAFunMum.) This might make a project suitable for a school sleepover. * If you’d like to explore resources about light, generally, Scootle has Light and reflection:using mirrors: the forest, Light and reflection:using mirrors: the pyramid, Light and reflection: light rays: seeing through walls, Light and reflection: light rays: shadow animals. * One way books light up our world is by revealing interesting facts to us. Have each child create a Did You Know fact and use each to make a collaborative display board for other grades/visitors to the classroom/library. * Another way books light up our world is by making it a very fun place to live! 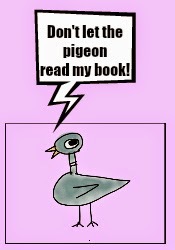 Kids who love the Mo Willems Pigeon books might like to innovate on “Don’t let the pigeon…” and compile a presentation like this one (with directions) from Tricia Fuglestad. *Students could invent dialogue to fill in speech bubbles for the characters in Bill Zimmerman’s free PDF e-book, MakeBeliefsComix FILL-ins, downloadable from this page. They could design their own conversation between characters discussing a favourite book. They could use MakeBeliefsComix or one of the other editors I mention in my free PDF, Using Comic Editors with Kids. * Go on a library search to find books with illustrations depicting actual lights like torches and lanterns, or pictures where the illustrator has used light in an interesting way. * Try a scavenger hunt or search for books about the world in your home or library. What do we know about the world already? What does the book we found tell us about the world that we didn’t know? * This year’s theme would make a fine time to introduce mystery books to the library or classroom. Wrap books in brown paper or butcher’s paper and add clues to the wrapped book. Clues could take the form of single words, images, both, a word cloud etc. In some libraries, mystery books are wrapped and the bar code affixed to the wrapping, so kids can borrow them while still unsure of the contents. * Another fun contest for Book Week is a book in a bottle contest. If you have a very old book that’s falling apart, add parts to a sealed jar or bottle. Or else you could type up key words from the book, then shred or rip the paper. You could also add little objects as clues to the bottle. * Reverse the idea above and ask kids to bring in a clear plastic container with clues inside that refer to one of the short-listed books. They could also have a voting container nearby where other students write down their guesses for the book represented. At a designated time, the first correct entry drawn from each voting container wins a small prize or certificate. OR Have one class create the book clue containers and the rest of the school must fill in a sheet with an answer for each one. * Have you thought about making digital badges students can earn to gain something they want, like special privileges or school awards? Here’s one badge generator where you can customise your badges, or educators can register with Class Badges to design digital badges and have them emailed. Kids can collect their badges with an app like PicCollage or a tool like ThingLink. * If you want to create a reading competition for your school, you could also design badges for reading a certain number of books, or a specific genre at Make Badges. * Ask kids to write mini book reviews and design book covers just like the ABC Splash contest earlier in the year: "Sketch a drawing of the book’s cover or one of the characters and write a tiny book review - no more than 25 words." * Looking for a way to engage teens in Book Week? The CBCA describe a “Youth Reviews” activity. “Although many schools are able to participate and/or watch the Youth Reviews videoconference there is another way of holding a similar event in your own school. Ideally three primary schools will participate, one as the host and two participating: one public, one Catholic systemic and the third a private school, if possible. Some areas are lucky enough to have other schools close enough that the students can walk. Two Stage 3 students from each school review one each of the Short List books for Younger Readers with the aim of trying to convince the audience that this book will be the winner. The audience will be made up of students from all three schools.” More information via CBCA. * Create a video book trailer with students. Tony Vincent has templates to support iMovie at his website. * Wonderful TL, Barbara Braxton, has some ideas for events that are book-related. Check out her list at 500 Hats. It includes literary luncheons, family nights and book clubs. * Explore and create shadow puppets. Here's a tutorial kids can watch before they experiment with creating their own. * Simple puppets can be used to interpret a book as a movie. Here’s the process used by Paperdoll Patrol when making a movie based on Where the Wild Things Are - Part One and Part Two. See the class’s final product. 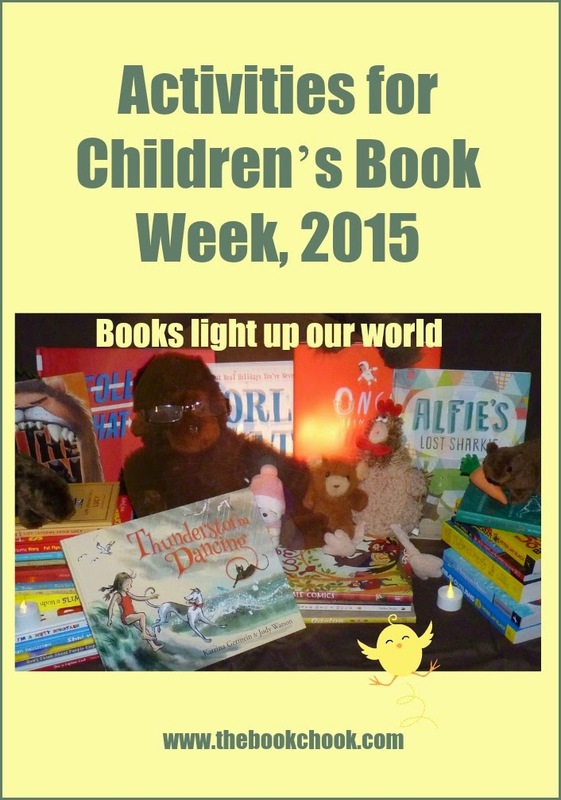 Promote the Book Week theme by encouraging kids to make Books light up our world bookmarks. 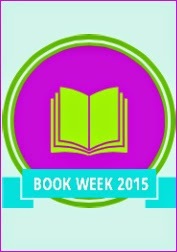 My free PDF of Children's Book Week 2015 bookmarks is at my website. Sometimes the books that bring the most joy and light to our world are those we write ourselves. Explore having your kids become authors. Make collaborative books with paper or using apps that generate e-books. Check out Creating Digital Stories with iPad or you can find lots of digital storytelling tools in my List. Not enough ideas here for you? Do not despair! Be sure to check out my articles: Book Week 2015 Challenges for Kids, Children’s Book Week 2015 Ideas for Performance, Children’s Book Week 2015 Ideas for Display, and Guest School Visits in Children’s Book Week. Find lots more ideas for celebrating Children’s Book Week in Activities for Children’s Book Week 2014, and Last Minute Activities for Children’s Book Week 2014. 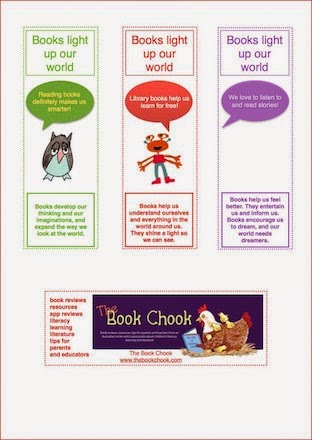 If you've enjoyed this post, or any others at The Book Chook, I'd love you to help me spread my literacy, learning and literature ideas by sharing via Twitter, Pinterest, Facebook, StumbleUpon, G+ or any other way you decide!